Okay, time for one of those wacky powers again! This is from issue #235, written by Danny Fingeroth (his only work on the title) and pencilled by Steve Ditko. 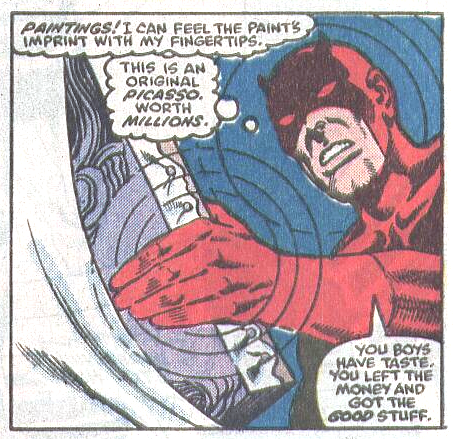 What we have here is Daredevil busting some arts thieves, and determining that they have stolen a genuine Picasso! Now how does he do this, you ask? Well, by feeling the paint strokes (and note the rather wacky extra radar rings coming from his hand in this panel…). I have a couple of problems with this power: 1) Paint feels like paint, feels like paint. I seriously doubt one brush stroke feels that different from another brush stroke painted by some other artists using a similar technique. 2) In order to determine that this is a genuine Picasso, wouldn’t he need some kind of reference to go on? That is, wouldn’t he have had to actually touch a genuine Picasso painting in the past in order to know what such a painting feels like? This is perhaps the most damaging piece of evidence, and the one that clearly proves that this power belongs in the wacky category. Very few people in the world are allowed to touch a painting by Pablo Picasso, and I doubt that Matt Murdock is among the few to have done so. Description: Panel shows Daredevil hold up a painting that was wrapped in sheets. He’s thinking to himself, “Paintings! I can feel the paint’s imprint with my fingertips. This is an original Picasso, worth millions.” He then says, to no one in particular, “You boys have taste. You left the money and got the good stuff. Having said so… Matt strikes me as a great art connoisseur… of sculpture! but hardly of paintings, as you say. In fact, my canon image of Matt’s relationship with Picasso is in the Secret Wars II issue, in which the Beyonder gives Matt his sight back: the day out with Glorianna in New York, with a VERY puzzled Matt staring at Picasso’s “Les Senyoretes del carrer d’Avinyó” while Glori cracks at his reaction is just priceless. I believe this is a good perception of Matt, whom I believe would have difficulty in appreciatting modern art if his sight came back. Damn, how is he ugly. Also, look at the detail of his ear. Either his mask is very very (insanely) tight… or is ear is painted red. You might enjoy this interview with former Spider-Man comics group editor Danny Fingeroth. Fingeroth is also the editor of “Disguised as Clark Kent” and “Superman on the Couch,” and is editor of “Write Now! magazine. Daredevil’s mask has always been shown to follow the contours of his ears. Does this really make sense? No. But it’s pretty much a constant of how he’s drawn, hardly unique to this panel. Wouldn’t it be interesting if this is the painting he has in his hands in this panel, and that’s why he’s able to recognize it? I could easily imagine that DD’s enhanced olfactory senses could tell that the canvas and pigments were aged and not a new forgery. Granted that to be a great forgery the painter would use period appropriate canvas and paints, natch. So still the scene doesn’t really hold up. Or does it? Could Matt recognize the EXACT scent of the canvas, the EXACT scent of the combination of paints on that particular painting he’d seen years before? But then again, he saw it when he had his eyesight back, and thus his enhanced sense of smell wasn’t working – it’s been well-established over the years, DD gains his sight, he loses his super-senses. So STILL the scene doesn’t hold up. LOL.